The program for the one-day workshop is detailed below. 9:00-10:30 AM -Form 3 groups of 3/4 persons break open sheets, pegs, portal and bridging and assemble your mallet. Close -Where to for your next WikiExpose? Use the blog/web page to register your name/contact where WikiHouseAU purchasers can contact you direct for their next ‘barn raising‘. Note only 18V battery operated drills, hand rasp, mallets and pegs will be used. Tea, coffee and water will be supplied and the nearby toilet open. Lunch is available for purchase at nearby Churn Park Shopping Centre. 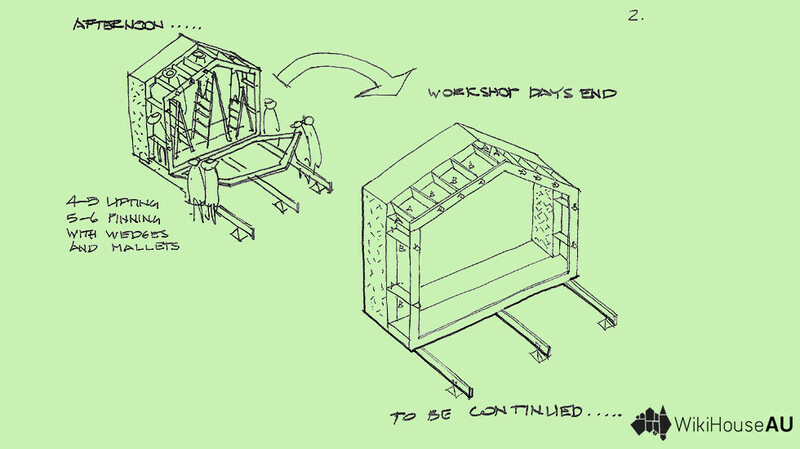 ← Why should I attend a WikiHouseAU workshop?